You probably do most of your daily work in programs other than Microsoft Outlook. You might create documents in Microsoft Word or build elaborate spreadsheets with Excel. When you want to send a file by email, Outlook gets involved, although sometimes, it works in the background. 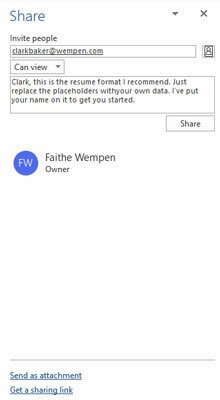 You can share a file by sending a link to a file stored on your OneDrive. If the file isn’t on your OneDrive, you’ll be prompted to save a copy of it there before you share. Open the document in Microsoft Word. The document opens on-screen. Click Share in the upper-right corner of the Word window. In the Share task pane, enter the email address of the person you want to send the file to. To enter multiple addresses, separate them with semicolons. If you don’t want the recipient to edit the file, click the Can Edit drop-down menu and choose Can View. This setting determines whether or not the recipient will be able to make changes. Type a message to the recipient if desired in the Include a Message (Optional) box. This message will appear as the email message body. The figure shows an example. You can email a link to a document right from Microsoft Word. You can also send a copy of a document as an email attachment. This method sends a separate copy to each recipient, and doesn’t require the file to be stored on OneDrive. Click Share in the upper-right corner of the Word window. This button provides a quick way to share; you can also use File, Share if you prefer. If the Share dialog box appears, click Word Document.m OR If the Share task pane appears, click Send as Attachment, and then click Send a Copy. Either way, the New Message form opens with your document listed on the Attached line, as shown here. If you want to type a message in the main part of the screen, you can, but it isn’t necessary. Enter the email address of the person you want to send the file to. To enter multiple addresses, separate them with semicolons. Change the subject line text if desired. By default it’s the filename. 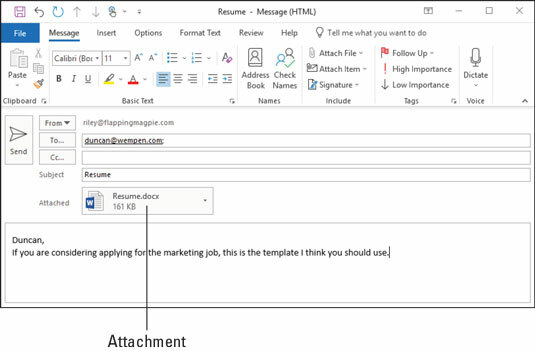 You can email a file as an attachment from Microsoft Word.